At 40°25' latitude and 3° 42' longitude, Madrid is centrally located in the Iberian peninsula.The climate is characterized by hot and dry summers and cold winters that are bearable when the sun shines. But as the sun disappears, it gets really cold.. 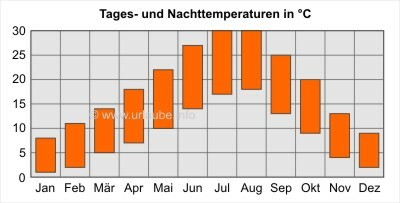 Most of the times, the spring and autumn seasons are moderated and pleasant, but strangely, it can also occur that the months of May and June are very rainy and that during this season it is warmer in germany. The months from April to June and September to October are mostly considered as the ideal time for travelling, whereby I personally would rather recomend the months June and September: it is not too hot; one experiences some warm days and early and/or late summer evenings that can be spent in open air bars. Many visitors do not balk at getting to Madrid in the high summer time - the Madrileneans, to the contrary, they escape during the months July and August to the sea. If one plans his stay well, the visit to the Spanish capital should be full of events. But one has to abstain from half of the sightseeings and excursions, as the city walks in the midday can be a torture. Instead, one should better get up early in order to have the walks during the morning. At noon time, one can get recovered in a bar or a small restaurant; After that, a museum visit is recommended (for example El Prado) or a midday nap in the park (be careful with the thiefs!). From 07.00 p.m., Mdrid awakes to life again, the terraces and bars are crowded again; Now, also a walk is possible, in order to finish the evening afterwards with a glass of wine or a chilled tonto de verano. During the winter, one can theorically visit everything, but the city walks and the excursions as for example to Toledo can be a torture. It is important to take some warm clothes that will help to have a good time in Madrid. But the "real" Madrid can be only experienced in the spring, early summer and late summer time by the warm temperatures, the evening flair on the terrazas and loafing through the oldtown. What should be packed in the luggage? The most important utensil is sun milk, but it can be also bought in madrid. During spring time, a protection factor of 12-15 is suffiecient (depending on how long one stays outside, one can also risk a sun burn during the month of April), in the summer, the protection factor should be 20-45, depending on the type of skin. What is also important depending on the weather is a headdress, in order to prevent a sunstroke. Specially during spring and autumn season, a jumper is very important, as it can get really fresh in the mornings and in the evenings. The Madrileneans barely use shorts; thus, those who do not want to "out" themselves as tourists have to adapt: depending on the sighseeing, at least the knees and in the churches at least the shoulders should be covered. Sandals might provide a good aeration but they are impractical if one is on his feet all day long; What is much more gentle for the feet is some good footwear; the sandals can be taken out for short walks or in the evenings. A small first-aid kit is a further utensil that should be taken into the luggage. Of course, in Madrid there are also medicines available; but the language barrier can be a problem, as eventually, the medicine there is of a different name. Due to this reason and also for the general understanding, a small language guide is very important. The best are language guides that focus on certain situations, as for example ordering a drink, shopping, etc. In the touristical areas, English is also spoken and there is a lot of information in english, but those who want to experience some culture should be up to roughly communicate in Spanish - no matter if with the help of a dictionary - the Madrileneans do appreciate this.